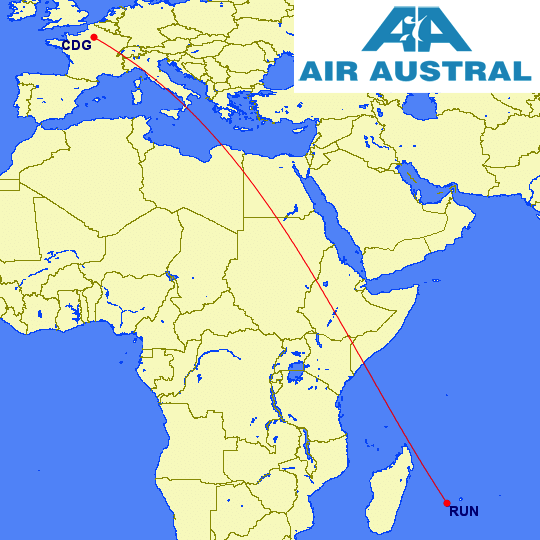 The winner: St. Denis, Reunion-RUN to Paris-CDG operated by Air Austral covering 5,809 miles in 11h 10mins on a B777. This is same ISO code to same ISO code, so quite technically it’s the longest non-stop domestic flight in the world. 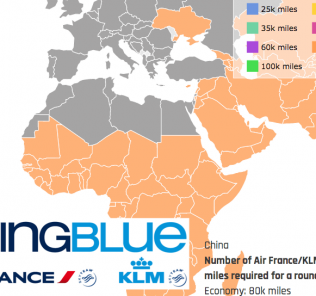 In addition to the CDG-RUN route, Air France, Air Caraibes and Corsair International operate flights from Paris-ORY to Reunion-RUN, which is just 7 miles shorter than the CDG-RUN route for a total of 5,802 miles. 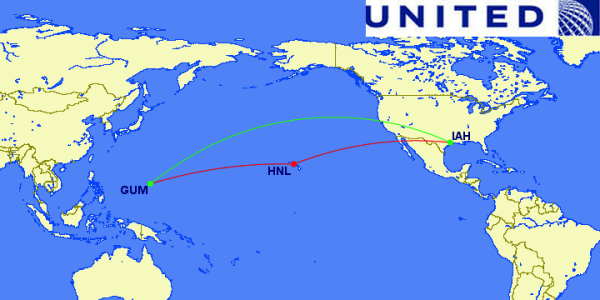 Runner up: USA coming in for a strong second with New York-JFK to Honolulu-HNL at 4,983 miles in 10 hours and 50 minutes. Operated by Hawaiian Airlines on an Airbus A330. UPDATE 8/10: Added AMS-BON route, thanks Scottbee/Boffin. Worth noting: A 3rd place medal goes to the Amsterdam-AMS – Bonaire-BON route flown by Arkefly’s 767-300 for 4,844 miles, scheduled flight time is 11h 0 mins. And…either France had a much larger Empire that I realized or they’ve just maintained control of the territories longer than say Portugal or Great Britain and can therefore be qualified as domestic. Either way, with these two flights below, France’s total has jumped to 3 of the longest domestic flights in the world. 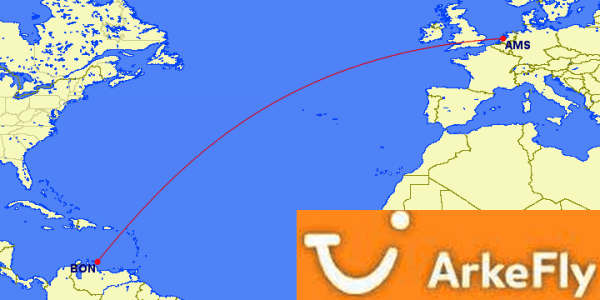 – Paris-ORY – Cayenne, French Guinea-CAY (ISO Country: FRANCE) – 9h 15m flight – 4,401 miles. Flown by Air Caraibes & Air France from ORY. 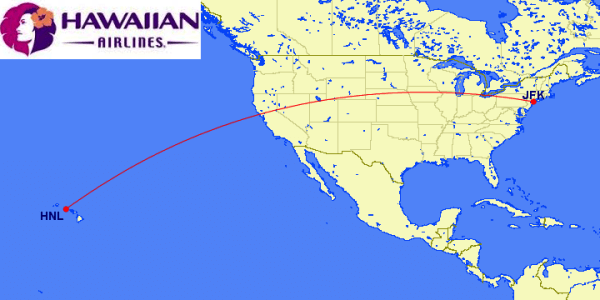 – Paris-ORY – Fort-de-France, Martinique-FDF (ISO Country: FRANCE) – 8h 50m flight – 4,259 miles. Flown by Air France, Corsair International and Air Caraibes from ORY. – Moscow-VKO – PKC is actually a few miles longer than the DME-PKC route. – DME-UUS is 10 miles longer than SVO-UUS. – Updates have been made below. Winner: Khabarovsk, Russia-KHV to Adler, Russia-ADL clocking in at 4,287 miles is flown on a Transaero B767-200 in 9h 30 mins. Interestingly, the Transaero website says that they fly the route in 4,271 miles making them either guilty of a typo or they’re fricken magicians. 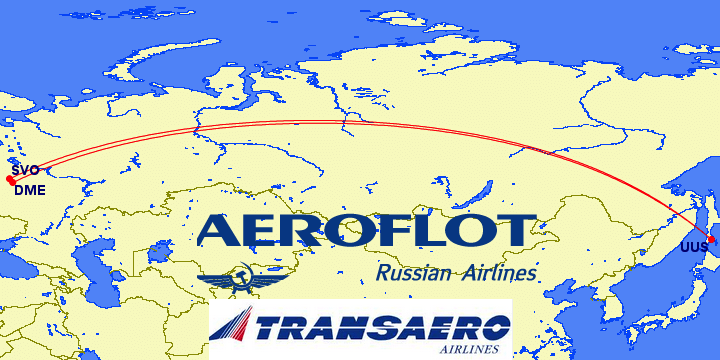 Moscow-VKO – PKC = 4,228 miles on a Transaero 767-300. Moscow-DME – PKC = 4,224 miles. 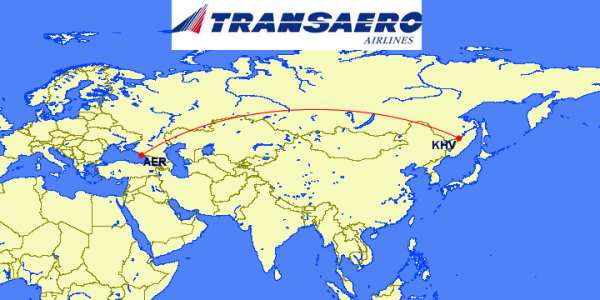 The flight takes 8h 40mins on Transaero’s B777-300. Moscow-SVO – PKC = 4,203 miles. 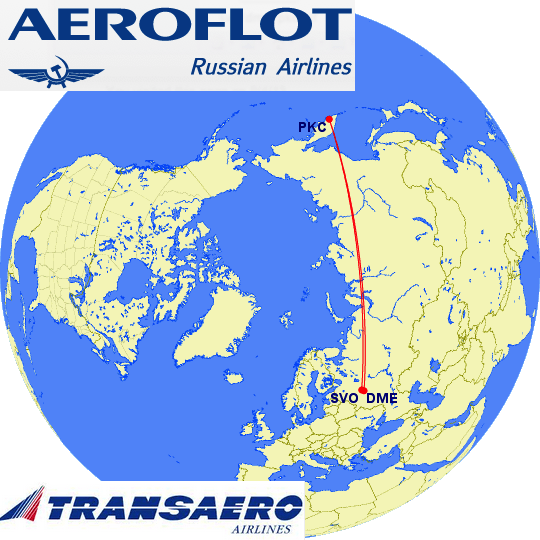 This flight takes just 8h 05mins on Aeroflot’s B777-300ER (Rossiya Airlines sells tickets as well). Runner-up Bronze medal to: The second third longest domestic flight is from Sakhalin, Russia-UUS to Moscow-SVO Moscow-DME for a distance of 4,140 miles 4,150 miles. Aeroflot’s Airbus A330 makes the trip in 8h 50 mins. Transaero’s B777-300 makes the trip in 9h 0 mins. 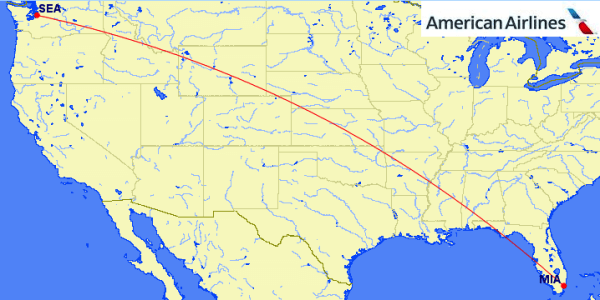 For comparison: The longest non-stop flight in the contiguous 48-states is Miami-MIA to Seattle-SEA on American Airlines at 2,724 miles in 6 hours 40 minutes. So, yes, if there’s one thing Russia is still better than us at, it’s being fricken enormous–really giving Texas a run for its money. 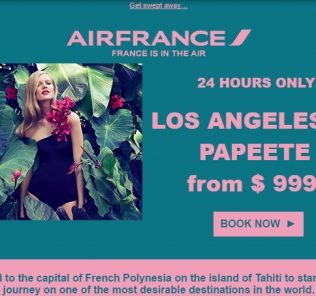 The winner: Paris-CDG to Papeete-PPT with a stop in Los Angeles-LAX. The cool thing? LAX couldn’t be anymore perfectly in route: the total distance with a stop at LAX of 9,765 miles — exactly matching the total distance if it could be flown directly. 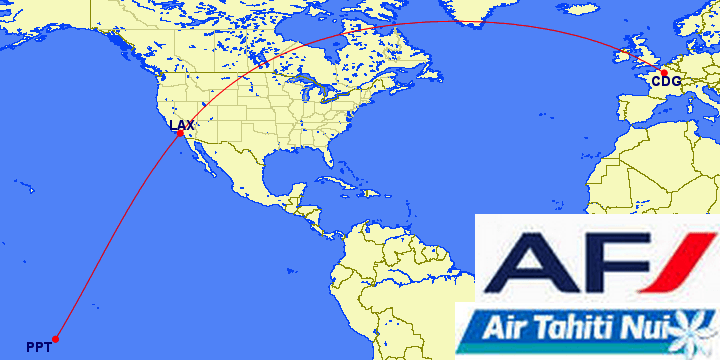 The flight is operated by both Air France (on a B777) and Air Tahiti Nui (Airbus A340) and takes a total of 22h 30mins: 12 hours from CDG-LAX, a 2 hour stop and a final 8h 30 mins on the LAX-PPT leg. Now should this officially count? Ehh, French Polynesia is just a territory but…Francois Hollande is the president. They do use their own currency, though. Either way, it’s on this list and pretty cool that you can fly CDG-LAX-PPT all on the same Flight #, without ever having to deplane (I think), although I’m sure you would at least want to! Runner-up: Houston-IAH to Guam-GUM with a connection in Honolulu-HNL. Flight #201 is operated by United Airlines and is technically 7,705 miles, though you could argue that only the direct distance of 7,446 miles should be counted. The total westbound trip takes 17h 1min: IAH-HNL in 8h 12mins, a 1hr 4 min stop and a 7hr 45 min flight from HNL-GUM. Same debate applies with Guam as did Papeete, should it be included? Well Obama is the President, they have a governor and they use the US $ as their only currency. Sounds like ‘Merica to me. Winner: RAF Brize Norton, UK-BZZ to RAF Mount Pleasant Airport-MPN (Stanley, Falklands) would come in at 7,840 miles if flown direct but since they have to stop for refueling in Ascension Island-ASI the total is 8,096 miles. But what’s so cool about this flight? The British Ministry of Defence (sic–as with most words in the Queen’s version of English) arranges the flights and sells only between 10-30 seats per flight to civilians. It used to be flown entirely on Royal Air Force (RAF) equipment, but now is contracted out to different charter companies. They fly a few times a week and sell seats that aren’t needed for British Military personnel. 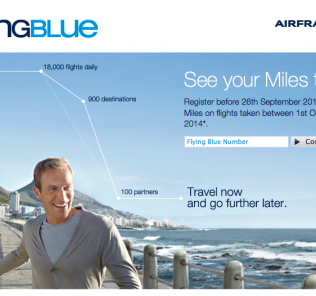 Don’t expect any deals, though: the flights will run you about £2,222 roundtrip ($3,450!). More info available here.